Did you notice the Buddha smiling gently down as he watched us running around like ants to honor His birthday on Wesak? Well, he sure was! If you attended the 4-day Wesak@BGF2018 celebrations recently, you might recall being greeted at the entrance to the Buddhist Art Exhibition by this image of the Buddha, eyes downcast with just the slightest hint of a smile. 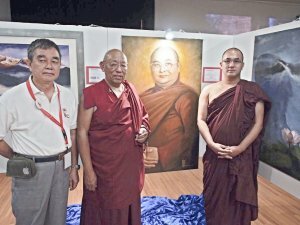 The Buddhist Art Exhibition was held in conjunction with Wesak@BGF2018 from May 26-29, 2018 to feature a collection of Buddhism-inspired oil paintings by Bhikkhu Uttamo, a talented artist and disciple of Sayadaw Janapurnik (Chief Abbot of The World Peace Temple in Kathmandu, Nepal).Proceeds from the sale of these paintings were in aid of the Nepal Earthquake Restoration Projects being undertaken by Bhikkhu Uttamo and his fellow Buddhists in parts of Nepal that have been severely affected. Bhikkhu Uttamo’s artwork is brilliant and depicts many captivating themes of the Buddha and Sangha. I was especially fascinated by the pieces that capture the sprightly yet reflective moods of young monks at play and prayer. BGF played host to a group of monastic visitors who were among the first to tour the Buddhist Art Exhibition, led by Bhikkhu Uttamo himself. This was followed by an elaborate Dana at the BGF Dining Hall. 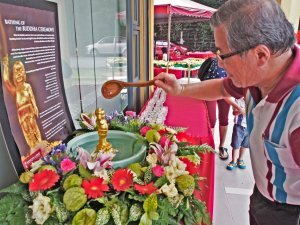 Throughout the weekend and Wesak Day eve, teams of volunteers, young and old, busied themselves setting up the premises for the big day and devoting hours to tasks like arranging candles and flowers. Wesak Day dawned bright and sunny. 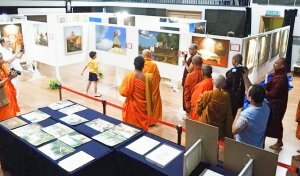 While the Buddhist Art Exhibition continued to see a steady stream of art enthusiasts, the Mini Food Fair and Jumble Sale too were enjoying a good crowd. Judging by the variety and amount of food that was on sale, I’d venture a guess that the enterprising chefs and bakers of the BGF Ladies’ Connection must’ve stayed up all night in the kitchen cooking and baking! 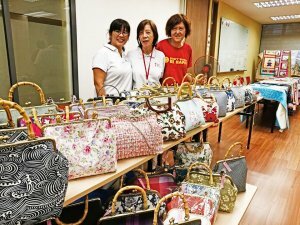 At the Jumble Sale, it was handmade gifts, bags and quilts galore, all painstakingly crafted over weeks and months by the creative hands of the BGF Ladies’ Connection. As visitors arrived, they stopped to “bathe the Buddha” and purchase flowers and candles as offerings to the Buddha on this auspicious day. 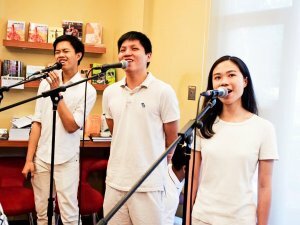 To the delight of many, the Gem Kids gave a performance followed by a blessing by Lama Samten who used a water spray instead of the traditional way of sprinkling holy water.